This title was first published in 2002. Since the importance of environmental governance was realised in the late 1960s and early 1970s, this vibrant area of law has witnessed much change. 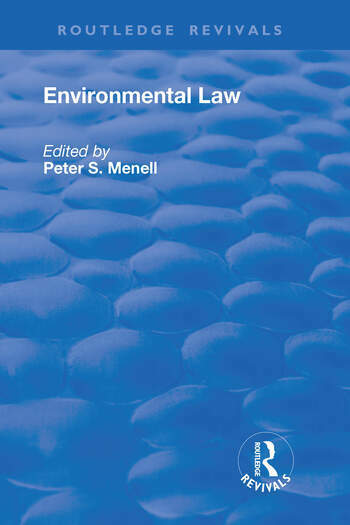 Assembling insightful essays from a number of key contributors, Environmental Law takes stock of developments to date and outlines the challenges for the future. Contents: Market Based Instruments: Currencies and the commodification of environmental law, James Salzman and J.B. Ruhl. Free Market Environmentalism: Free market versus political environmentalism, Terry L. Anderson and Donald R. Leal; Prescriptions for the commons: environmental scholarship and the fishing quotas debate, Alison Rieser. Contractual Approaches: The new 'contractarian' paradigm in environmental regulation, David A. Dana. Liability Approaches: The limitations of legal institutions for addressing environmental risks, Peter S. Menell. Information Disclosure: Information as environmental regulation: TRI and performance benchmarking, precursor to a new paradigm?, Bradley C. Karkkainen; Structuring a market-oriented federal eco-information policy, Peter S. Menell. Industry and Community Based Governance Institutions: Reflexive environmental law, Eric W. Orts. Analysis of Institutional and instrument Choice: Regulatory pluralism: designing policy mixes for environmental protection, Neil Gunningham and Darren Sinclair; The choice of regulatory instruments in environmental policy, Nathaniel O. Keohane, Richard L. Revesz and Robert N. Stavins; Name index. ’This book provides a thorough, comprehensive, and well-balanced appraisal of current issues relating to the choice of regulatory institutions and instruments. It will be an invaluable guide for environmental policy analysts.’ Daniel Farber, McKnight Presidential Professor of Public law, University of Minnesota, USA ’More than any other legal field, environmental law has unceasingly reinvented itself during its brief three decades of existence. Menell captures a snapshot of this dynamic field as it enters its fourth decade, in the best concise treatment to date of how we manage the environment. The introduction surveys the broad landscape of environmental protection approaches - from regulation, market instruments and liability to information disclosure and reinvention� - in an admirably clear and accessible manner, free from obscure and technical jargon. The volume’s inclusion of key articles then provides readers with a deeper, more sophisticated understanding of particular instruments - how they work, when they don’t work, and how they're evolving. The net result is a survey at once broad and sophisticated, offering insights not only into U.S. environmental law at the beginning of the 21st century, but where it’s going from here.’ James Salzman, Professor of Law, Washington College of Law, American University, USA ’This book provides a comprehensive, contextually rich and highly readable analysis of the evolution of environmental regulation and the role of new institutional approaches, and makes an important contribution to the field.’ Professor Neil Gunningham, Research School of Social Sciences, Australian National University.